These are the bonuses that it can roll. Join the discussion on our forums! Come discuss Unidentified Maul over in our dedicated Unidentified Maul discussion topic. Whoever thought about taunt option being good should be fired, one of the worst designed cards ever, Imp-losion 2.0. 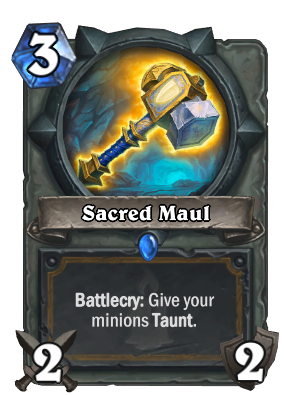 I swear its bugged i get sacred maul (the worst one) 75% of the time or greater. Like I just went on this page to check out if this weapon isn't glitched, but I must be just unfortunate as I have NEVER EVER SEEN any other upgrade besides Purifier's Maul. 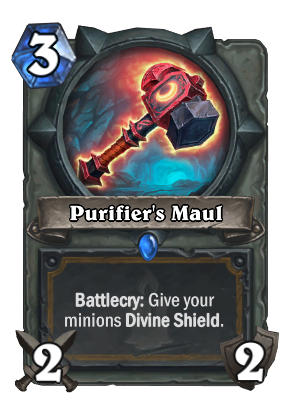 Purifier Maul is frequently the best one in the decks that run this. Divine Shield makes it much harder to remove board and allows snowball synergy cards like Tarim, or the Adapt Minions to come into play on a large board. 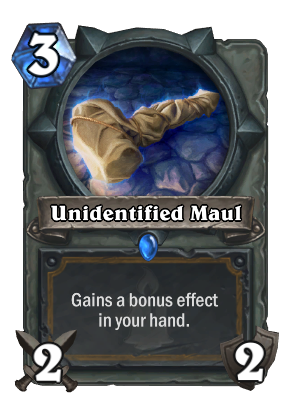 I feel like Unidentified Maul has potential in aggro paladin decks, but it will have to wait until Rallying Blade rotates out before it will see play. Am I the only one triggered by the fact this card is Rare but Unidentified Shield and Unidentified Elixir are Common? I felt the same when I saw Forbidden Ritual was Rare but the rest of Forbidden stuff was Epic. This has to be a common! There is no way it isn't because paladin now has 4 rares which doesn't make sense! So my only guess is that they screwed up the rarity of the card since this unidentified object isn't common like the others! It's going to be the return of Shockadin. Nah, Shockadin existed in a time when going face was more important than having a board. Maybe Recruit Paladin will use this. 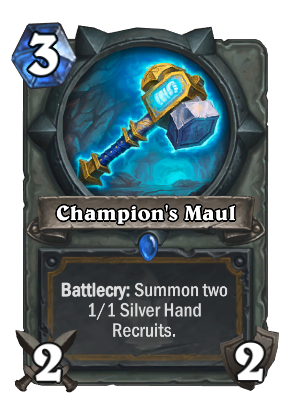 Playing this on curve, you'll probably WANT the Silver Hand recruits. How many other minions are you really going to have at that point to benefit from a buff? Take a spin on the Wheel of Light's Injustice! Where every draw is different, but they all have one thing in common: The odds of it actually being what you want are just a 1 in 4 spin away! So, without any further ado... What's? Under? That? Cloth? ...Ooh, tough luck, pal! Best of luck with all those Taunts against this Priest. I hear he's got some new... Oh. Well, that's just unfortunate. But that's the chance you take with the Wheel of Light's Injustice! See you next time, folks! 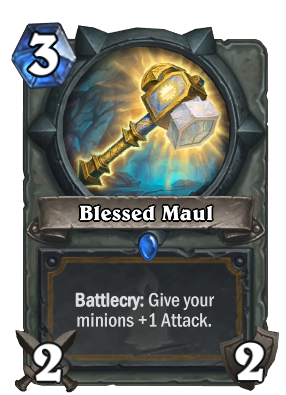 So is every class getting an unidentified spell/weapon[/minion]? They said every class gets a spellstone but I didn't hear anything about them all getting a unidentified item. I like these unidentified card types. All the options are good and fir for the mana cost, plus having another weapon is always useful. Meh, could be good but it seems like too much of a coin flip to rely on. If silver hand decks become a thing in standard then this might be ok.
75% of the time this has a good effect. Is it worth 3 mana? No.